Maximize your performance and muscle gains with this essential sports nutrition ingredient. A weightlifter’s will and determination will only take them so far in their quest for physical perfection. To truly maximize strength and muscle gains, dietary supplementation is an essential component that has been proven time and again to enhance the results of weightlifting performance. The development of CarnoSyn® beta-alanine, a leading ingredient in sports nutrition formulations has truly revolutionized the way in which athletes at all levels are able to develop greater muscle mass. CarnoSyn®, the only patented, highly bio-available version of beta-alanine, is backed by over 55 published, peer-reviewed clinical studies. Beta-alanine, a naturally occurring amino acid, supports the synthesis of muscle carnosine – which acts as a buffer against lactic acid, delaying the onset of muscle fatigue and failure. Elevated levels of muscle carnosine can enhance endurance, speed recovery, sharpen your focus and increase muscle strength. Various clinical studies have demonstrated that properly loading beta-alanine not only boosts muscle growth, but also helps to enhance your physical working capacity and peak performance capabilities. Want more proof? Further scientific findings show that athletes who loaded at least 90 grams of beta-alanine over 28 days saw marked improvement in performance, and those who stepped up their intake to 179 grams over the same period significantly amplified their results. So what makes CarnoSyn® beta-alanine so potent in its ability to build better muscle and help you perform at the top of your game? We break it down with six simple facts you should know about this must-have, muscle-building ingredient. 2) The 90/28 Threshold: To reap the muscle-building benefits of beta-alanine, athletes must load the scientifically proven dosage threshold – at least 90 grams over a 28-day period (an average of 3.2 grams per day). Those who are new to taking beta-alanine may choose to start with a lower daily dose and slowly increase their intake over the course of four weeks until reaching the 90 gram accumulation. 3) Step It Up to 179/28: To amplify your muscle performance and endurance, bump up your daily dosing to hit the scientifically proven maximum threshold of 179 grams in 28 days (an average of 6.4 grams per day). When it comes to beta-alanine, more is better. New sustained-release SR CarnoSyn® delivers higher levels of beta-alanine more comfortably in a single dose (but we’ll get into that a little more in just a moment). 4) Take It Every Day: Consistency is key. To achieve peak performance, beta-alanine should be taken every day, not just on days you workout. However, one strategy for reaching the optimal dosing threshold is to take more on training days than on non-training days, in order to take advantage of the more immediate benefits of beta-alanine while you lift. 5) Stack It: CarnoSyn® beta-alanine can be stacked (taking multiple products containing beta-alanine on the same day), whether through a pre-workout, post-workout or stand-alone product, or as a combination, to equal or exceed an average of 3.2-6.4 grams total per day. Ongoing studies continue to show its other benefits and the possible synergistic effects of CarnoSyn® when stacked with other ingredients, such as BCAAs, creatine and protein. 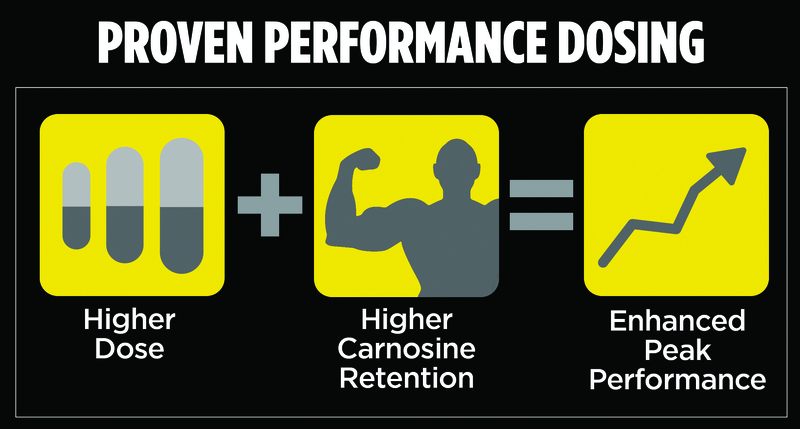 6) SR CarnoSyn® for Higher Dosing: Numerous studies performed around the world using CarnoSyn® beta-alanine have demonstrated that the increase in muscle carnosine is dose dependent. 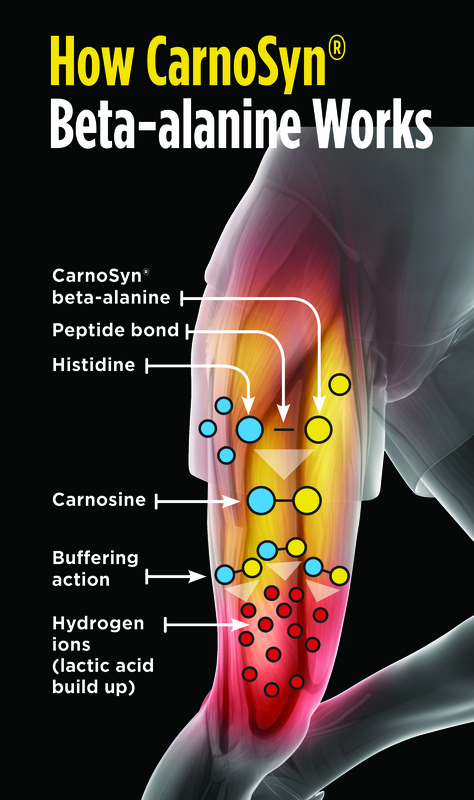 SR CarnoSyn® sustained release beta-alanine is a patented delivery system that allows athletes to consume higher single doses to shorten loading time and reach peak performance benefits faster. Confirm you are supplementing with an efficacious dosage to ensure you’re getting the most out of your supplement regimen and reaching the proven performance-boosting benefits that CarnoSyn® and SR CarnoSyn® have to offer. Sponsored by CarnoSyn®. These statements have not been evaluated by the Food and Drug Administration.These products are not intended to diagnose, treat, cure, or prevent any disease.